Summary: BHSI has tested helmets to determine if commonly used cosmetics, sunscreens, insect repellents, etc. might damage helmet materials enough to affect impact protection. Lab test results showed no effect on performance, despite some evidence of surface damage from some of the products. BHSI bought 50 helmets to be tested. The helmet model chosen was the Giro Section, a molded in the shell bike helmet meeting the CPSC standard. It is a skate-style helmet with a thin shell. It has minimal vents, helping to produce consistent test results. Most bike helmets are constructed this way. We bought the helmets rather than asking for a donation to avoid any complications. 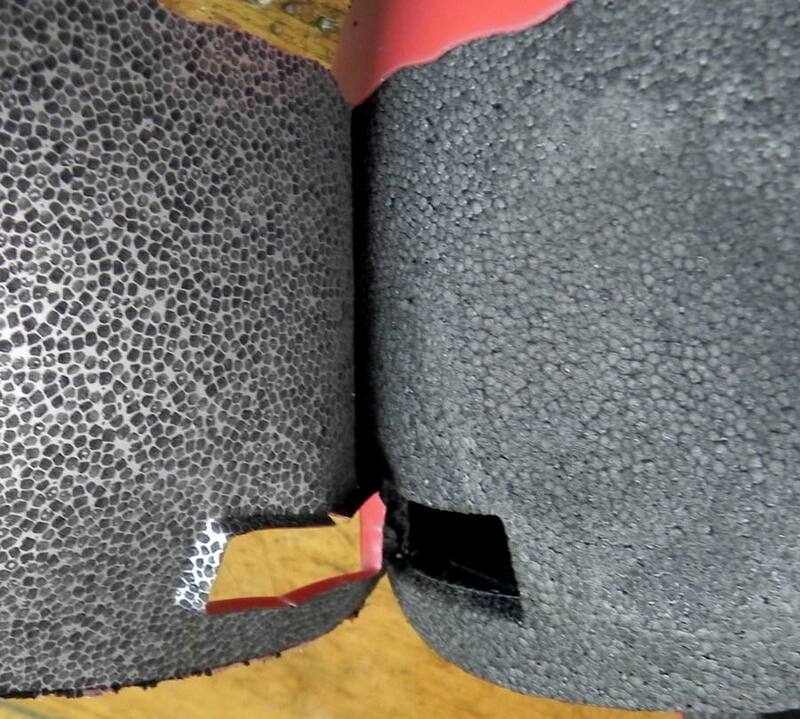 The Giro Section has a section of higher density foam in the front part of the liner to reduce the thickness of the helmet there and still pass the CPSC impact tests, so we were testing the two different foam densities and the line where the sections join to see if any of the substances could penetrate between them. Lab testing of impact performance after exposure to the various substances is the only way to determine if any visible damage actually resulted in reducing the helmet's protection. If the helmets did not pass the CPSC flat anvil and curbstone drops we would consider the product tested to have done damage. We also expected to note any changes in impact performance short of failing the standard. Prior to the beginning of the dosing, an accredited independent testing laboratory tested four control helmets in their lab to establish a performance baseline. Here is helmet with the test line and test locations marked. 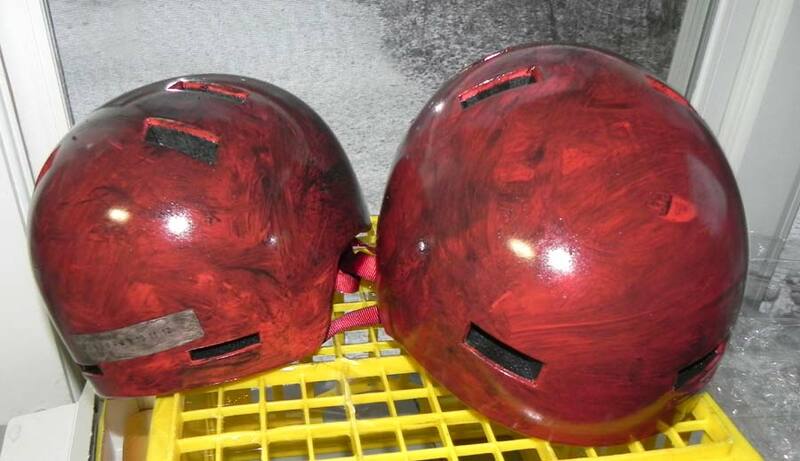 Two helmets were tested dry at ambient lab temperature. Two were tested after a four hour soaking in water in case wet samples of the treated helmets might prove more prone to impact performance changes. Another sample was tested hot, and one tested cold to find out if we needed to test those too (we did not). Test locations were front, rear, crown and each side. BHSI assembled 20 substances that might damage helmets. We had reports on some of them. We included gasoline to show what could happen if a substance aggressively attacked the foam, not because it is likely to be splashed on helmets. Interior fit foam pads and stickers were removed, but the straps left intact for lab testing and no other modifications were made. Beginning in October of 2011, two helmets were wiped inside and out every two to five days for 16 total doses with each of the products. The products were either sprayed on, applied to a cloth and smeared over the inside foam and outer shell, or just smeared on with rubber gloves. As expected, gasoline destroyed the foam helmet liner, melting large channels in the foam that reached down to the shell. The two products with DEET appeared to have degraded the foam significantly. The inside surfaces of the liners of those helmets were sticky and soft. 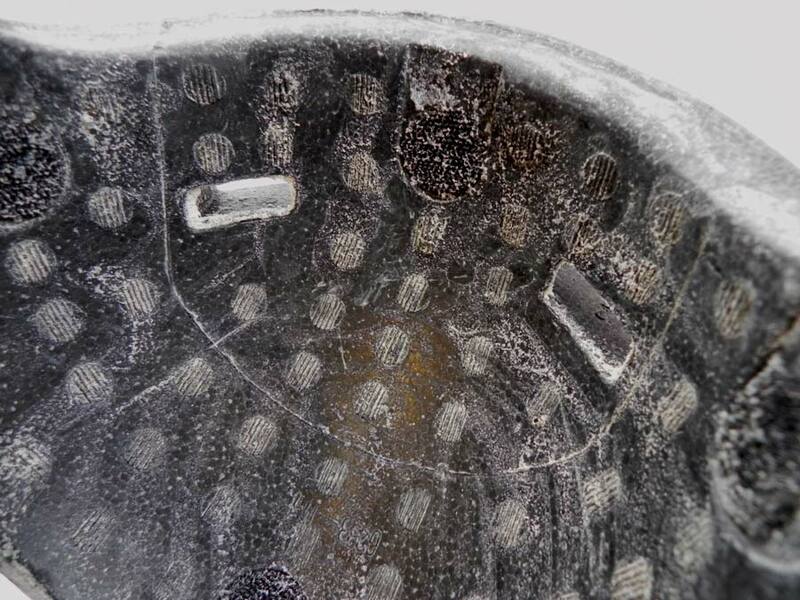 But here is the same helmet when we cross-sectioned it, after the lab testing, showing that the zone of liner damage was very thin. The two lotion sunscreen helmets experienced surprising levels of foam degradation. The surface of the liner was soft and very sticky. Rubbing a finger across the liner resulted in black goo sticking to the fingers, a mix of foam and sunscreen. The third sunscreen helmet, dosed with Kinesys spray, also had obvious surface foam damage, but it was not as pronounced as the creams were. The three formulations of Rogaine tested all had the same effect: the helmets were discolored by a white film that formed inside and out. The Men's Rogaine formulation left the most pronounced film, and washing the helmet did not remove it. There was no apparent foam damage to the Rogaine helmets. We did not see any obvious damage from the Foltene women’s hair treatment, and it did not turn the helmet white. The helmets dosed with chain grease did not show any apparent foam degradation. The chain grease was based on synthetic oil, not petroleum. It blackened the surfaces of the helmet inside and out. Most of the discoloration washed off with a mild detergent before shipping to the lab. The other substances did not appear to have caused foam damage, including the two hair sprays, the gels, the shampoos and the Sawyers non-DEET insect repellant. 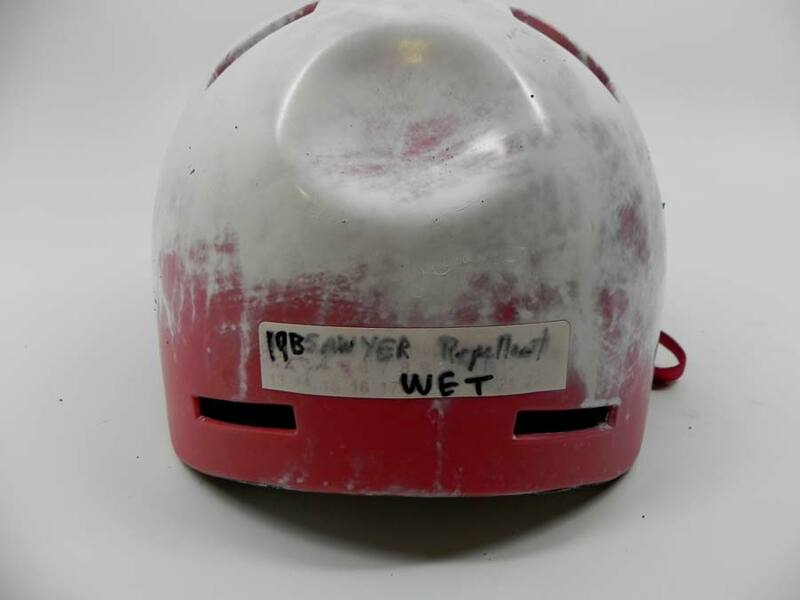 But the Sawyers helmet shell turned white when the lab submerged it for the wet test. We thought that the Lice Shield helmet would be unusable for anyone with a normal sense of smell. Lice Shield is one of the nastiest-smelling substances you can find in a drug store, with an intense and sickly floral aroma. 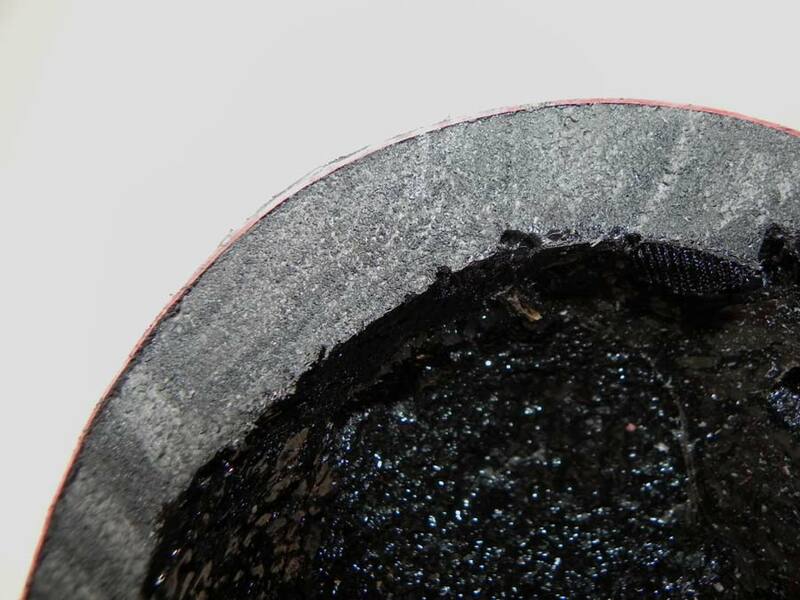 We did not see any obvious opening of cracks between the two liner sections, and did not detect any visible differences in the way substances attacked the two densities of liner foam. This helmet dosed with Rogaine shows clearly the line between the two foam densities. Note that the above are just visual observations. 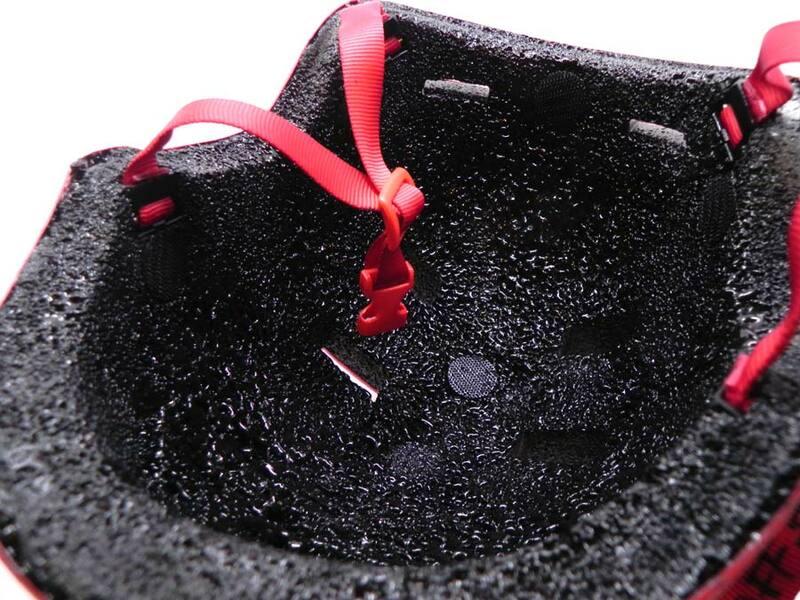 Only the lab tests described below could show if the observed foam deterioration actually caused the protection of the helmet to be degraded. In most cases it did not. 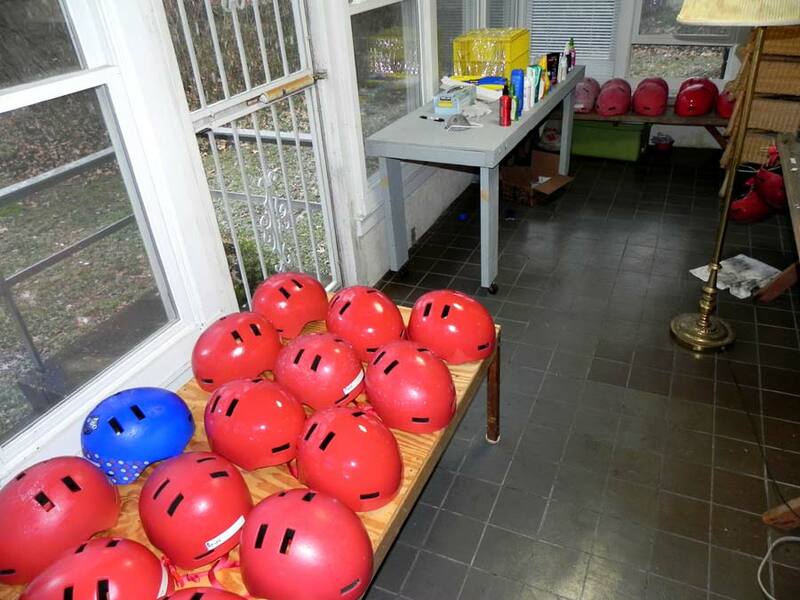 After the treatments were finished we washed the gunk off the helmets with warm water and a mild dishwashing detergent, then shipped them to a leading fully accredited test lab in January of 2012. The lab tested the same five locations on each of the dosed helmets to determine if their performance had changed. Each pair was impacted, one helmet in ambient conditions and one helmet after soaking in water. The wet test, as called out by the CPSC standard, was intended to show if any product had opened up fissures in the foam that water could penetrate and produce hydraulic effects in an impact. The testing uses calibrated impacts with the helmet positioned on a metal headform and dropped in a guided fall onto fixed flat, hemispheric (similar to a half grapefruit) or curbstone-shaped steel anvils. At the center of gravity of the headform is an accelerometer that measures the g force in the impact. If the peak acceleration imparted to the head form exceeds 300 g's the helmet fails the standard. In this case we were looking for any degradation of impact protection. Here is a testing video on the CPSC site. On each helmet two impacts were on the flat anvil at 6.3 m/s, a two meter drop. Two were on the hemispheric (grapefruit-sized) anvil at 4.84 m/s, a 1.2 meter drop. The fifth was on the curbstone anvil at 4.84 m/s. The results were surprising to us. Having observed the surface damage, we expected some of the helmets to fail. 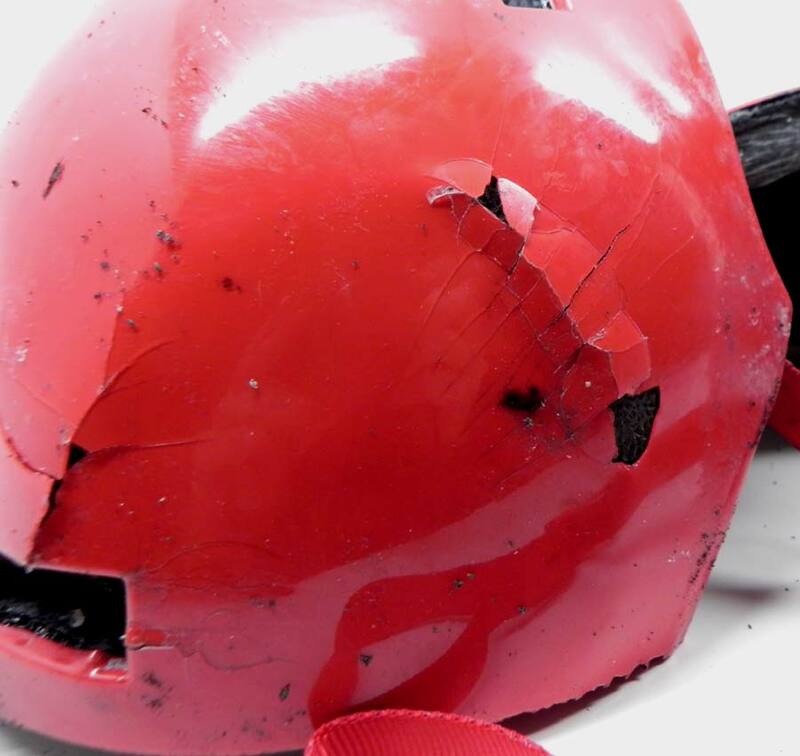 But only the gasoline-damaged helmet showed a deterioration of impact protection. Despite the readily apparent surface damage detailed above, the helmets performed so closely to the reference helmet that no real differences in test results emerged. All of the helmets except the gasoline sample still passed the CPSC bicycle helmet standard. All variations in g ratings were within the normal testing range. There were cracks in many of the shells, but only the Coppertone sunscreen clearly made the thin shell more brittle, and even then there was no effect on the test results. 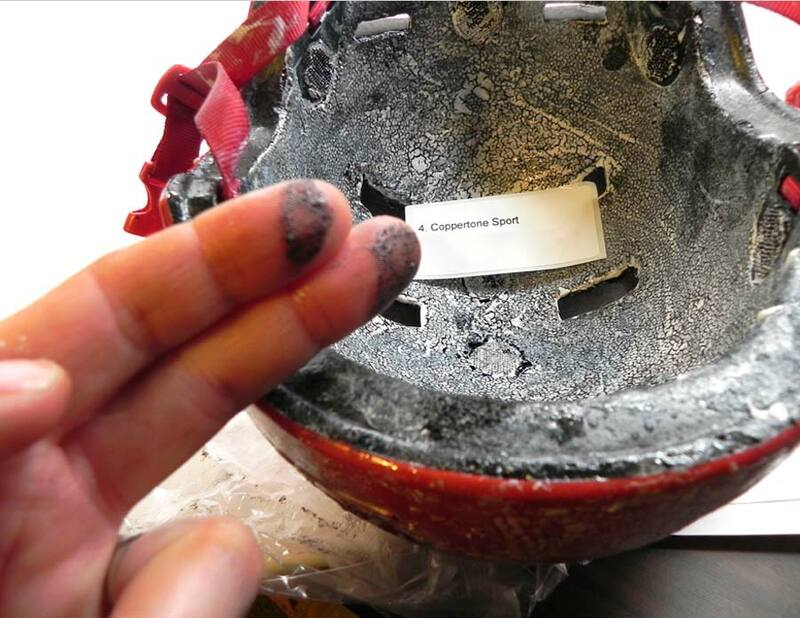 The surface damage from smearing or spraying products directly on the helmets is not likely to be replicated in normal use. Most riders use fitting pads in the top of the helmet that limit head contact with the liner foam, reducing exposure to products used on the head. We have seen minor surface effects from repeated use of sunscreens on bald heads in actual field use, but nothing that approached our direct application testing. The white film from Rogaine or effects of other products might build up over time, prompting replacement of the helmet before it is really necessary, however. One limitation of testing with only one helmet model: our helmet was molded in the shell, a process that bonds the shell so tightly with the foam liner that if you tear the shell off (to the left in the photo below) it pulls off the top layer of foam cells from the helmet on the right. 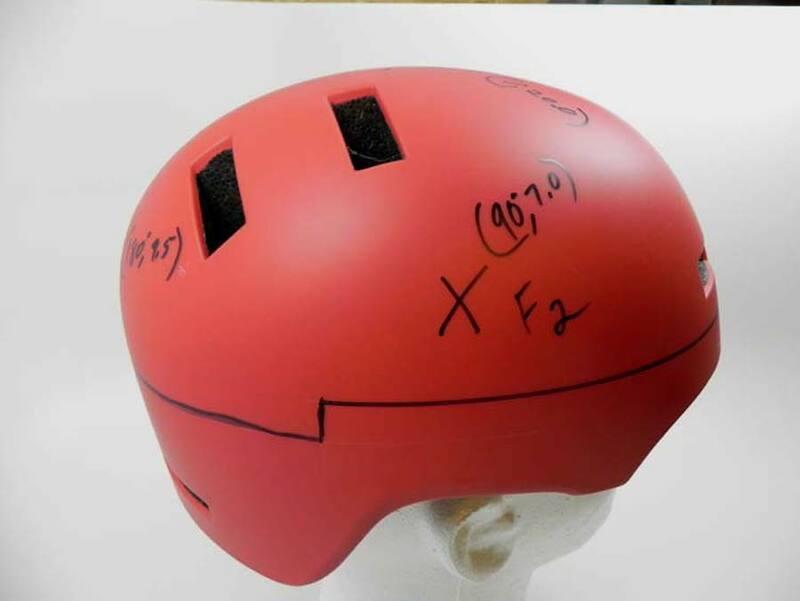 A cheaper helmet with a taped-on shell would have less reinforcement for any damaged areas, and might show more performance differences after product dosing. Another limitation was that with the exception of gasoline and chain grease we tested only products applied directly to the head or skin. There are reports from one equestrian helmet manufacturer of helmets damaged by insect sprays used in horse stables while the helmet was hung on a wall. In one case there was even an unconfirmed report of damage from concentrated gasoline fumes in a closed room. We don't have any data on that kind of damage. We would still avoid applying any hair product, sunscreen or insect repellant directly to a helmet as we did in these tests. And if you use sunscreen or insect repellant on your head before riding you would always want to wash it off the helmet with dishwashing detergent and water afterward, or just take it in the shower with you. But the lab tests demonstrated that minor surface effects from incidental contact are not likely to significantly degrade a helmet's impact performance. Here is a page of photos to provide more detail. Here are the actual test numbers from the lab. This project cost about half of our annual budget, but we think it was worth it to document answers to a much-discussed and little-tested question.